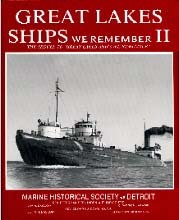 Part of the stated mission of the Marine Historical Society of Detroit is the publication of scholarly works exploring the history of Great Lakes ships and shipping. Here's a list of of our past projects. While out of print, copies may be available at your local bookstore or online sites such as eBay. 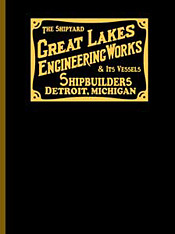 (2009) This popular work explores the history of the Great Lakes Engineering Works, a prominent Detroit-area shipbuilder. More than 500 pages long, this hardcover book was written in two major sections and illustrated with more than 1,000 photographs. The first section depicts GLEW's three shipyards and their development at St. Clair, Ashtabula and the Detroit area. 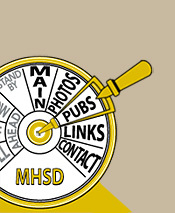 The second section is dedicated to the 300-plus vessels that were built by GLEW's three yards, describing each vessel's history in detail and with most entries accompanied by many previously-unpublished photographs. To read in your browser, click the section link you want and a new window will open with that section. To download the files, right click and use "Save Link As" option. If you need Adobe Acrobat, use the link below. 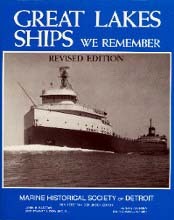 These three hardcover volumes recall hundreds of Great Lakes vessels in story and pictures, many of which were briefly discussed in the Detroit Marine Historian's Ships That Never Die series. Many of the photographs that were used in these publications came from private collections and were not available elsewhere. 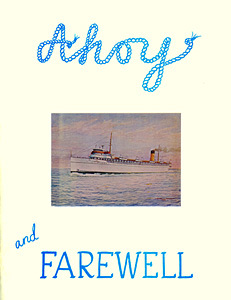 (1970) This softcover first volume of Ahoy & Farewell was originally written in 1969 and published in 1970 to commemorate the 25th Anniversary of The Marine Historical Society of Detroit, Inc. 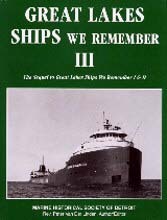 It, along with certain supplements to the monthly Marine Historian, briefly chronicled vessels that entered service on the Lakes (Ahoy) or that had left the Lakes (Farewell) since the Society's inception in 1944. It included 50 pages of text and 24 photos. 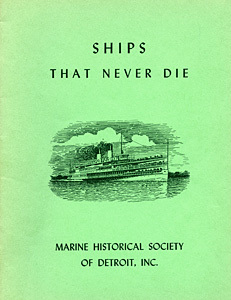 (1952) Predecessor to Great Lakes Ships We Remember, this softcover booklet briefly portrayed 45 well-known ships of the Great Lakes, reprinted from the Detroit Marine Historian and edited by the Rev. Edward J. Dowling S.J.